Dorm Co. Tip: Keep your boots in their original good condition with a boot rack! Boots are always gorgeous with an outfit. And once you have one pair of boots, you realize how great they look and you decide you need more pairs in different colors and styles to go with other outfits. The problem? Storing them. Boots are incredibly hard to store! They don't fit in normal under bed shoe storage dorm organizers, and if you have them sitting out on your floor or other dorm storage for shoes, they get damaged. How do they get damaged? The upper part of the boot flops over and when it spends enough time flopped over, the material starts to crease and they never look the way the did when you first got them. This is incredibly frustrating because boots are expensive. 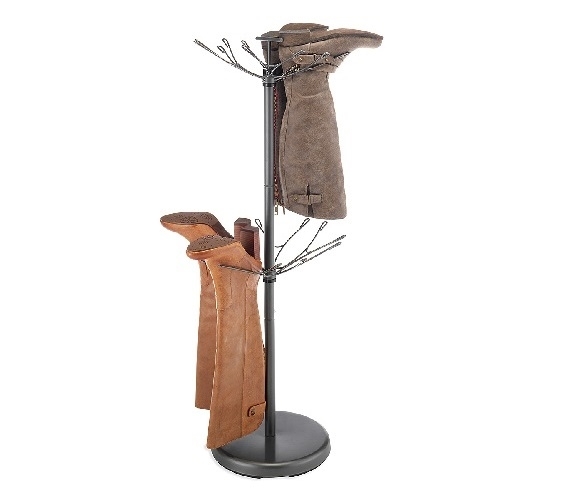 Keep your boots in their original nice looking condition with our Revolving Boot Rack in Steel Gray! Our Revolving Boot Rack in Steel Gray can easily fit inside of your dorm closet or sit outside in an area of your dorm room and add to dorm room decor. It has a sleek, simple style that will add to your dorm room storage while adding to your dorm room decorations. There are two levels of hooks that hold the heaviest bottom part of your boot so the upper part of the boot hangs upside down and doesn't crease. Keep dorm essentials like your expensive boots organized and in good condition by having our Revolving Boot Rack in Steel Gray in your college supplies!